Here’s one of those recipes that pops out of my folder when I see burstingly fresh zucchini at the produce stand. 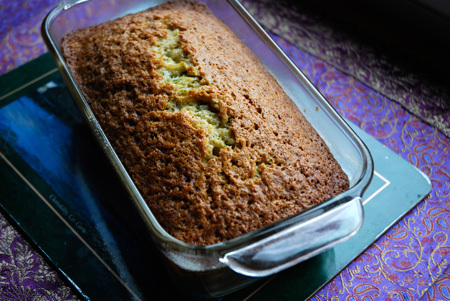 It’s adapted from a recipe that’s been passed around in my family as ‘Doris Fenton’s Zucchini Bread’ for donkey’s years and so, when I cut half the oil from the original recipe and tweaked other ingredients to suit, it only seemed fair to carry on the name. As a kid, it fell to me to pick the zucchini, which I did as best I could. Eight to ten inches long: snip went my knife through the stem flesh and I put another zucchini into my basket. For a while each summer, I kept the zucchini under control. But then, after a week or so of diligent harvest, I would begin to find other zucchini. Big zucchini. Dark green zucchini with thick skins. Zucchini that dogged my dreams, lurking under the prickly leaves in the shadows so I somehow missed them. When those zucchini came out of hiding, it was all I could do to work the knife through the stem and wrestle the big buggers out from under the plants. Sometimes late in the evening I’d smuggle a couple of those monster zucchini over to the neighbor’s garden and slip them under his zucchini plants. I’d see him out there the next morning leaning on his hoe, lifting his hat and scratching his head, but if he suspected me he never let on. Quite honestly, I think he suspected my father. 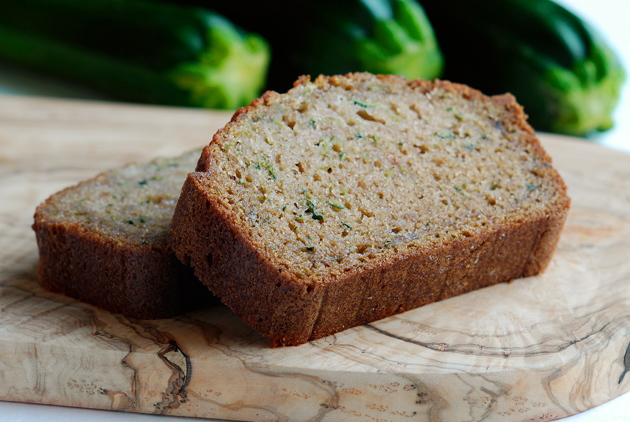 This zucchini bread may have half the oil, but it has all the flavor of the original. 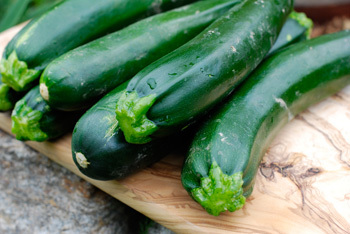 Select medium-sized, unblemished zucchini that feel heavy for their size. And, although I’ll be choosing them from my local produce stand, you can certainly grow your own… if you dare. 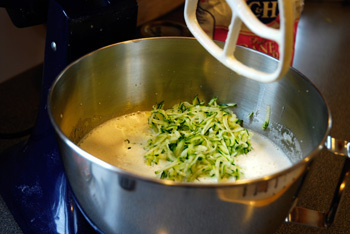 Note: If the zucchini is not fresh – either days old in the fridge or store bought – decrease the flour to 2 ½ cups. Zucchini fresh off the vine has more moisture. Set rack in center of oven and preheat oven to 375º. Using a flat beater, beat eggs until frothy. Beat in the sugar. Add oil, apple juice and vanilla and beat until thick and lemon colored. Mix together the flour, cinnamon, baking soda, salt and baking powder in a bowl. Add along with the zucchini to the egg and oil mixture and beat until blended. Pour evenly into 2 buttered and lightly floured glass loaf pans. Bake for 10 minutes at 375º. 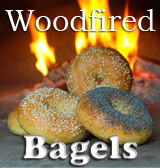 Lower heat to 350º degrees and bake for 1 hour longer. The loaves should have a dark skin with splits along the top, and a toothpick inserted into one of the splits should be nearly clean, with no batter buildup. Cool in pans on rack for 15 minutes. Gently remove from pans, using a sharp knife if necessary, and then cool for an hour or more before serving. Freezing note: This bread freezes very well. Although you can freeze whole loaves, we like to do it in halves for flexibility. Wrap each half in plastic wrap, label, and slip two halves into a loaf bag before freezing. If you exclude all the air, they will last up to a year. Lovely photos and such a great idea with half the fat… Thanks for sharing. Your zucchini bread looks light and delicious, yum! Oh my! That looks to die for! looks delicious! zucchini bread is the only way i’ll eat that vegetable, too! If I add blueberries does that increase the moisture like fresh zucchini? Looking forward to trying it. Your zucchini bread looks so moist and yummy! I love when you can see the bits of zucc in the bread This looks fab.. I am always down for trying a new recipe so I think I’m going to have to give this a go! this is my favorite. i need to try this soon. thank you. I really love the look of this bread…def my type of food! Yum! Love how zuchinnis keep the bread nice and moist! It’s great to find lighter recipes, especially for yummy things like this. But how is this recipe considered “light?” It uses whole eggs. It includes apple juice, which I assume takes the place of some oil, but is that it? I think when someone posts a recipe and includes “light” in the title, they should include the nutrition values, or at least a description of why it is considered light. 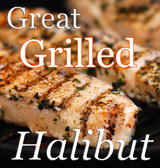 Note: If you click the link to open a copy of this recipe in Word, the subtitle says “Half the fat with all of the flavor.” I don’t see that subtitle on this web page. Oh, I see what you mean, 3D. I’ve just made a correction. Thanks for pointing that out! Don I’ve used your family’s Doris Fenton zuchini bread recipe for years. Your sister passed it onto me unmodified decades ago, but now I only use your modified version. It is a favorite at our house, and it’s delicious! I sometimes make loaves of this bread for gifts, especially if my garden is full of zukes! Thanks Judy, and thanks also to everyone who appreciates a good zucchini bread. Here at Chez Bullhog, it’s a blue-ribbon winner! That’s such a beautiful loaf of zucchini bread, even without using yeast. I love it. Thanks very much for sharing. Must be so much fun harvest zucchinis. Ha! I love you smuggling zucchini into the neighbor’s yard! Clever. After growing up with the same plethora of zucchini, it hurts to have to pay for them. But my garden grows weeds best. I’m still waiting for the tomatoes to ripen. I’m going to make this recipe into mini muffins for my 1 year-old (who does not do well with finger food except bread, biscuits, muffins, etc); should I change the temperature also or just the cooking time? I’d recommend lowering the oven temp by 25 degrees, making sure the oven is well preheated, and watching them through the glass to see when they are medium brown on top. Your daughter will love them! BTW, you might want to try a test batch, as I often do in cases like this.